You know me, I find something fabulous and I want to share it with you. 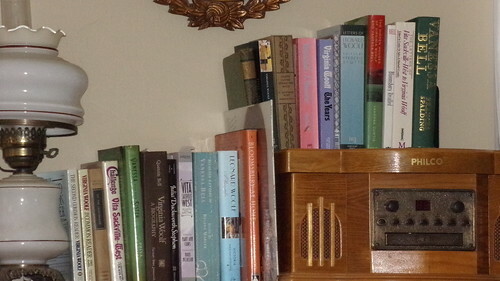 Here it is, no fanfare or music or anything, just simple: E-books all in one place, all by Virginia Woolf. Wow. … you’d find more, more and MORE e-books online. I know, it’s old hat now, that these places exist. Most of the time, I prefer real live physical books in my hands to E-books, but there are times when just sitting here at my computer and clicking on a link, which takes me into the mind of my hero, Mrs. Woolf, for example, is just about the best thing since sliced bread. A few weeks ago, I was looking for a Virginia Woolf book that I knew I had here but could not find it quickly. 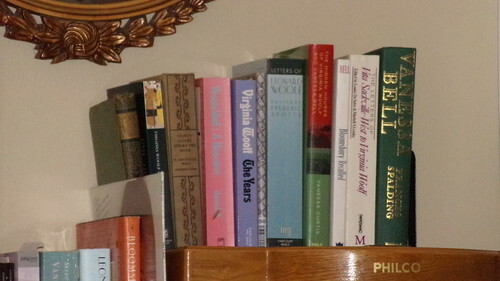 So I set about searching, in all my various books-spots, the books related to Virginia Woolf, and her group of friends, that live now in my house. Some are by Virginia Woolf, some are by Vita Sackville-West, Virginia’s sister Vanessa Bell, and others are by or about those wondrous members of the Bloomsbury Group which I hold in such high esteem… and now I can find them quickly! If only the rest of my books could be this organized! I wish this blog had a “LIKE” button I could click for your comments… or a “LOVE” button, even better! Haven’t read any Virginia Woolf since college, but that handy link you posted is now dutifully bookmarked on my phone, where I do most of my reading. Thanks! Thanks for the links Bex. Wow, a Hogarth Press edition, lucky you! I admit to preferring paper books, they have so many advantages, the bookmarks are easy to find, there is no fiddling with technology, I find them much easier on the eyes, and much easier on the hands and arms. I find that when the books are on the computer I forget about them, but when I have a lovely paper copy by the bedside I am always gently reminded that there is a treat waiting for me. By the end of the day my eyes are weary and basically giving up for the day, so a digital edition is nice, because I can open up the book and get the computer to read the text to me. It isn’t quite like Mom, I have to read along for a few minutes to pick up the “accent” of the computer, but then it is fair sailing. Currently I am reading The Good Earth by Pearl S Buck, digitally. Before that I read Pavision of Women by Pearl S Buck, a hardcopy book, so much better! I can’t remember how much it cost me ERIC, but it may have been around 8 to 10 british pounds. No more. From Abe Books. They are great for finding first editions. Oh wow! That’s extremely cool. I figured those would be impossible to find or afford. I am impressed. WOW!!!! !you been a busy bee with books. I don’t have any first edition Hogarth Press books, but I try to make up with my vast collection. 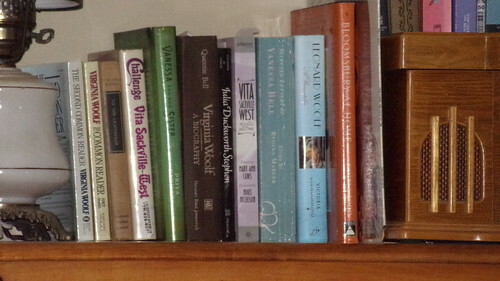 I have so many Virginia Woolf books, books by her, about her. I will, I swear, make it to the end of Voyage Out, Virginia’s first book, but it is chewy. Eric — Oh, ye of little faith! For shame… of course I have a First Edition – and published by the Hogarth Press! What do you take me for anyway? THE EDWARDIANS BY Vita Sackville-West, First Edition, Hogarth Press, 1930. And Ava, now you can read them, one and all, here from my blog page… just click on one and go! Try reading her short stories… they are much easier reading than her novels. I love them. I have a bunch of them here in book form, but these clickable e-books are just the trick for a lazy afternoon! Of Ms, Woolf’s books I only know Mrs Dalloway and I admit I saw the movie. I am ashamed to admit to reading almost nothing unless it’s in the computer. 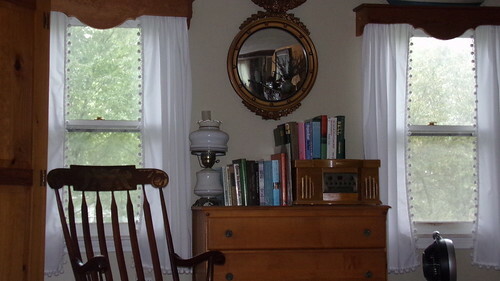 Every time decide to read a book, Kindle or real McCoy I fall asleep and wake with the open book on my chest. i am such a sleepy head all the time. Age or meds?. Anyway, as much as I’d like to have a lovely library with rows and rows of wonderful books, it’s just not going to happen. Thanks for all your posts. It amazes me when I think about her hand setting type to be printed on a small press on the dining room table. I used to print magazines on a spirit duplicator and even on a hectograph, but that was easy compared to letterpress. There is, of course skill in printing physical books and I am sure Virginia Woolf would side with you in your preference for paper. I fear I’ve gone over to the electronic side! I have only read To the Lighthouse but as with so many authors I plan to read more. I can’t say she makes for easy reading. I think I grasped what she was getting at in the Lighthouse only because she used a philosophical example which seemed to have come straight out of a book on philosophy by Bertrand Russel from the same era, which I had just happened to have recently finished.